I have a photo I'd like to enlarge and am not sure how to best go about it. The image is 4626 pixels wide and 3084 pixels tall. I may print the image as large as 30 inches wide and 20 inches tall. I have access to Lightroom 5 and Photoshop CS4. One option I see is to output directly from Lightroom and set the ppi in the neighborhood of 150 (this would result in 30.84 inches by 20.56 inches). But how would this be different than, say, setting the ppi to 300 and letting Lightroom "enlarge" the photo? An Internet search on the topic suggests quite a few different ways to approach this problem. If any forum members are particularly fond of one method or another, I'd love to hear about it. Thanks! For starters, I would not decrease the ppi to 150, that's 'newspaper' resolution unless it's a super large poster viewed from meters away like those big billboards. You can drop to 240, however, some labs when printing want 300 ppi in their specs. 3 ways you can go about it. How to get the pixels dimension figures to upsize? : To take any guesswork out of what to put, first open the image in Photoshop. Ctrl/Shift I ('eye') to get to Image Size. Take note of the settings in this screenshot, once you key in 'Pixels' in top panel, you immediately get a 'inches' size of image it will resize to, then you know what to put in LR if using that. But you would need to take a good look at it, you would not want it 'fuzzy' on enlarging. Going the LR route I would re-export a RAW file in PSD format in sizing it up, and do any edits there after. 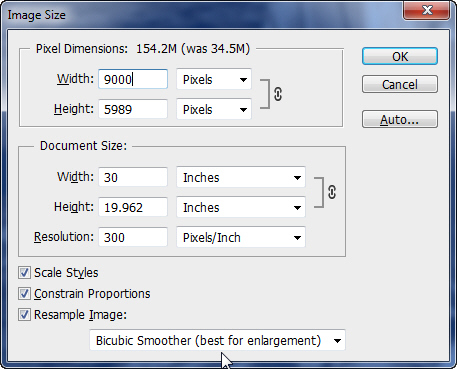 Photoshop: As above, make sure you choose the 'Bicubic Smoother' option, best for enlarging. 3rd Option: 3rd party software specialising in enlarging. I use Perfect Resize 7 part of OnOne's bundle and it does a superb job in enlarging my images, especially 30x20 and above for canvas printing. Cannot speak highly enough of it, but, that costs money. Price: $179 Full Price Bundle. 30-day Free Trial available. Specs are awesome as I said. I also use Perfect Resize 7 and feel that it is probably the best software out there for enlarging photos. If you are in a position that you will be doing this often, then I would make the investment. If this is a one time deal, set up a dropbox account and I'm sure someone on this forum that has Resize would help you out. sovaphotos said: If this is a one time deal, set up a dropbox account and I'm sure someone on this forum that has Resize would help you out. Yep, great idea Sovaphotos, you can or I will for sure. Also if it's a Gallery Wrap for canvas I also will do that, just give me the 'wrap-around' frame measurements, the normal size is 2 inches so a 30x20 would be 34x24 inches includes the wrap. Perfect Resize can do wraps very easily, but, if an important part of the image is near an edge, I prefer to do in Photoshop, duplicate a 2 inch section near edges, flip so it's 'mirror' and done.